Your investment consists of two elements: the Photo Session and Product Collections. Photo Sessions include your design consultation, wardrobe and accessories, and your photographer and assistants' time. Location and weekend fees apply. Product Collections start at $995, which is our minimum purchase requirement. All products - including digital files - are separate from your Session Fees. All products such as albums, custom framing and digital files are purchased separately from the Photo Session. Collections range from $995 - $2795, or design your own custom package. There is a minimum purchase of $995 for each individual Photo Session. 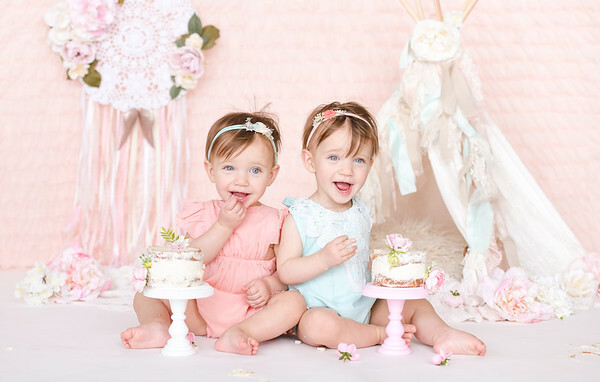 As a premiere first birthday photography studio and over a decade of experience photographing thousands of babies, rest assured that your little one is in the best of hands. We know the importance of preserving your family's most precious moments, and our team will document your baby in a creative and unique way. We are proud to provide an unforgettable experience and create stunning portraits that celebrate you and your baby's big milestone. 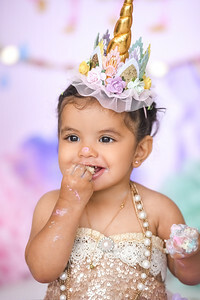 First Birthday sessions are recommended to take place between 10-11 months old to ensure you have all of your artwork in time for the big day. Please give us a call at 310-391-4500 to have your session confirmed on our calendar. We typically book up 2-4 weeks in advance and recommend a minimum of 2 weeks planning and design time with your photographer; however, we do often have last-minute availability. To confirm your session, we require a non-refundable 50% deposit of your session fee. 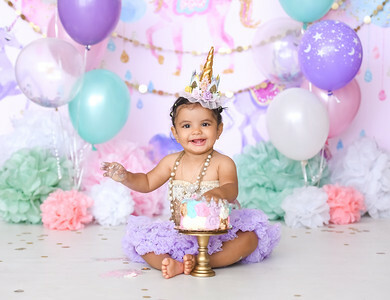 Your first birthday session is custom tailored to you and your baby, and we will meet before your session at our studio to discuss style, colors, props and wardrobe, as well as your custom-designed smash cake. 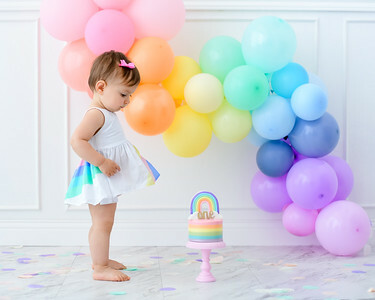 We specialize in creating custom sets that reflect your party theme, nursery colors, hobbies, career or any unique ideas you may have. Your personalized smash cake will be delivered to the studio before your arrival. Outfits and accessories for your baby are included with your session and everything is washed after each session with detergents that are free of harsh chemicals. For more elaborate set designs, additional charges may apply - just talk with your photographer about your vision and we will bring it all to life! Approximately two weeks after your photo session you will return to our studio for your 90-minute ordering appointment. As a full service studio, we offer a variety of heirloom albums, custom framing, boutique party invitations/thank you cards and a variety of grandparent gifts. We have a full time re-toucher on staff, and natural-looking re-touching is included with everything that you purchase. Your investment consists of two elements: the Photo Session and Product Collections. Photo Sessions start at $400 and include your design consultation, props, wardrobe, your photographer and assistants' time, editing and the custom design time that goes into your session. Product Collections start at $995, which is our minimum purchase requirement and range from $995 - $2,795. All products - including digital files - are separate from your Session fees. At your ordering appointment you will decide which of our three Product Collections you would like to purchase or if you would like to go with our "all digital" option. You do not need to decide in advance of the Session which Collection you would like.